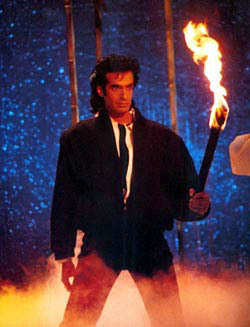 Copperfield shown here using the “fire trick” to fool Mark Teixeira into doing the impossible- hitting to the opposite field. As reported in the New York Post, the Yankees fired Kevin Long, the team’s hitting coach since 2007, on October 10. The Bronx Bombers struggled at the plate during the 2014 season, finishing the year with a team OPS (on-base percentage plus slugging average) of .687, 12th out of 15 American League teams. For the season, the Yankees hit 147 home runs, 7th in the AL (the Orioles led with 211) and a far cry from the 245 the team hit in 2012. The Yankees new hitting coach dated model Claudia Schiffer for six years. This entry was posted in Sports & Leisure and tagged Brian Cashman, Mark Teixeira, Yankees. Bookmark the permalink.